PSY was undoubtedly the Internet star of 2012 — after ‘Gangnam Style’ rose from nowhere to become YouTube’s most watched video ever — and Korea’s KT Corp is aiming to seize on global interest in the Korean wave with a music app dedicated to the country’s pop industry. The company — which runs mobile operator KT — has announced the international launch of Genie K-Pop, an Android app dedicated to K-Pop music, which is now live in 45 international markets. The service was initially launched in South Korea nine months ago and it has the backing of KMP Holdings, a music distributor that has partnerships with seven of Korea’s largest recording labels. KT says the app is the first dedicated K-Pop app to become available to users outside of Korea. The service allows users to buy music direct from the app and users are given a free one minute preview of songs, in a move aimed at helping them ‘try before they buy’. Certain tracks — those labelled with an ‘F’ — can be played back for free. Search and discovery is aided by a ranked chart list, in addition to popular — ‘hot’ — keyword searches. Interestingly, KT says that it has raised royalty fees for artists to 70 percent in a move that it believes will “set a new trend” in Korea’s music industry. As The Economist explains, the royalty payout for artists is “miserly”. Though Korea’s music industry generated an estimated $407 million (430 billion won) in revenue in 2011, artists often make as little as $0.03 (30 won) per track — and that figure is divided between the label, writers and artist. Genie K-Pop makes use of a variable pricing mechanism — through its ‘Moving Price System’ — that means the cost of each download is defined by each song’s copyright holder. That could make pricing interesting and give artists a chance to promote themselves using heavy discounts for certain periods of time. The Android app comes with all the usual features, like push notification, sharing to social networks, etc. A streaming service will launch for international markets soon, but there’s no word on an iOS version of the app. 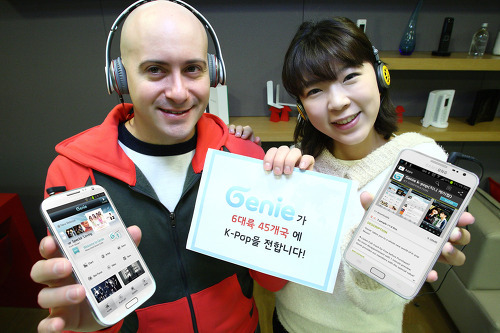 The Genie K-Pop service has been likened to iTunes in Korea and, though it is not likely to see that kind of traction globally, it will be interesting to see how it is received worldwide. PSY has given K-Pop a higher profile worldwide after his hit song became the first YouTube video to rack up 1 billion views. That exposure has boosted Genie K-Pop’s potential for success and the service has a far higher chance of gaining traction outside of Korea today than it did a year ago when PSY was unknown internationally. The app is available in 45 countries, across 6 continents, which include: the US, India, Singapore, France, Germany, Russia, Spain, Brazil and Australia. The full list can be found here. If you’re a K-Pop lover in Belgium, Canada, Hong Kong, Israel, Italy, Japan, South Africa, Thailand, Turkey and the UK will have a wait on your hands as the app is making its way to these additional 10 countries soon.